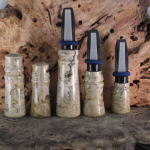 I also want to acknowledge the wonderful cooperation and “fill-in-some-of-the-blanks” info given to me by my dear friend, and expert coyote hunter, trapper and hunting and fishing guide, Phil Schweik of Hooksetters Guide Services in Mosinee, Wisconsin. First – -let’s talk about the animal itself. Coyotes range across most of the United States. Science calls them “Canis latrans.” I call them “wily varmints” – -like in the Road Runner cartoons. Whatever you call them, they are a lot of fun to hunt. And before anyone starts singing “God Bless Texas”, or sniff about how hunting is ALWAYS better in the West, just know this: Coyotes are SMALLER in the West, than those in the eastern states. Coyotes in the East will go around 30 pounds for a female, and average about 45 pounds for a male. In the West the coyotes will average about 10 pounds less – plus or minus. The reasons? Better food sourcing, and less actual hunting in the East. 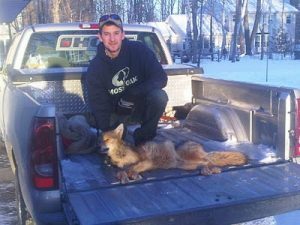 While popular, coyote hunting in the eastern states is still sort of an “acquired taste,” as compared, for instance to deer hunting. 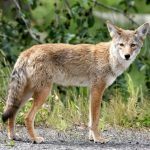 It should be noted that coyotes can carry disease – -such as hepatitis, tularemia, paro virus, distemper, rabies, mange (caused by parasitic mites), ticks, fleas, worms and flukes. Just be cautious, that’s all. Now – -let’s get to the “nuts and bolts.” Everything talked about in this first “just the basic facts ma’am” article will be expanded on in detail in additional articles addressing a specific topic. 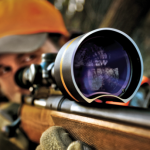 Coyote hunting is very simple and an easy sport to get into. Not a lot of equipment is necessary. Basically, all you’re going to need is a small caliber rifle, or a shotgun (and yes there are coyote hunters who use a pistol or a bow and arrow). You’ll need “calls” –either mouth or electronic, depending on your state or area regs. You may or may not want a decoy, which may consist of something as simple as a tuft of rabbit fur attached to a whip rod. There are two basic methods of hunting coyotes. First, there’s the “sit and call” method, which can be used day or night (winter in Wisconsin is “primo” for coyote hunting with snow on the ground which is solid and frozen, and allows for a perfect silhouette on a moonlit night), and then there are avid coyote hunters who use specially bred and trained dogs, with radio collars, who flush and chase the coyotes to the hunters who are following and circling the “coyote drive” areas in some type of motorized vehicle. Some night coyote hunters use artificial lights for illumination – -and not bright halogen lights- – muted, colored lights like green or blue (I keep saying this, but it’s worth repeating: check your regs to see what is, and what is not allowed – -every single state is different). Others set up on elevated deer stands. Still others will set up a ground blind, much like something that’s used for deer hunting – -but usually simpler. One other thing to note: Some days or nights, the coyotes are moving all over all the time. And there are days and nights, where you won’t see a thing. Nothing will move. That’s just the “luck of the draw,” sort of like musky fishing – -the fish of “ten thousand casts” – -you may catch a musky, but it’s not guaranteed. Same with coyotes. Lots of hunters actually make a few bucks on coyote hunting. After the hunt, they take the animal to a local fur buyer and sell it for its hide. 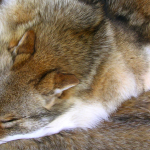 Lots of things are made from coyote fur and hides – -hats, gloves, and coats are examples. And that’s another reason to hunt in the winter – -that’s when the hides are their peak condition. 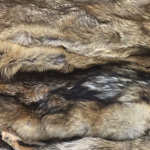 Depending on the market, you can get from $35 to maybe $50 for a prime coyote hide. 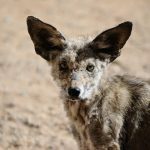 There are two different layers of fur on a coyote- – the short, heavy under fur, which feels almost like very soft, “thick” cotton, and the outer fur which has the longer guard hairs, and protects the under layer from brush, and moisture, while keeping the animal warm. Coyotes are actually very beautiful animals. 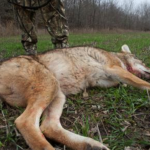 And finally – -coyote hunting isn’t like deer hunting. Usually, it’s a “day trip” type of hunt. You go out for a day, or a night, and use your truck or small portable shelter to rest or get warm if need-be. And yes, there are “coyote camps” here-and-there, but it’s not that common – – at least in Wisconsin. Part of the appeal of coyote hunting is that it isn’t a huge, complex operation. You get out. You take your equipment, and you hunt. It’s inexpensive, and doesn’t take up a lot of your time.